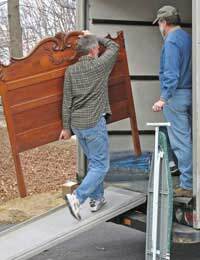 Moving furniture from one house to another is usually the trickiest aspect of all the items you’ll be looking to move. For one it’s big and bulky and it’s often difficult to get through doors and sometimes the only way you can get it out is through a window. Also, a lot of furniture can cost a considerable amount of money and, as many of the larger items can’t be stored in boxes, there is more risk of damage occurring. Here are some useful tips to help prepare your furniture for the move. Before you even reach the stage of removing the furniture, making preparations in advance will make things easier for you in the long run, so take an inventory of all the items of furniture you intend taking with you and categorise those items which can be disassembled separately from the other items. Items which can be disassembled should be wherever possible. Yes, it will be time consuming but it will make the removal job easier for you ultimately. Make sure you have all the correct tools at your disposal for disassembling legs, glass table tops, shelves, book cases, wardrobes, doors and frames etc. It’s also a good idea to keep plenty of bin bags to hand to ensure that you put each dismantled section of a specific piece of furniture into the same bag. Don’t be tempted to put all the bits from everything into two or three bags all jumbled up as it will be a nightmare to put everything back together again later. Keep a writing pad, bin bags, sticky tape and a marking pen to hand so that you’ll know which items belonging to which piece of furniture are in which bag when it’s time to reassemble. Make sure you also keep any nuts, bolts and screws relating to the piece of furniture in a separate bag too. Don’t think about leaving any self-assembled furniture in its completed state. No matter how well you think you’ve assembled your flat-pack wardrobe, these kinds of items can become notoriously unstable in the back of a removal van. And, don’t forget to put all of the assembly instructions in with each bag too. Cushions and pillows etc. should be put into large clear rubbish sacks and you should make sure there are no holes in the bags and that they are fastened securely. The main problem with larger complete pieces of furniture which can’t be disassembled is usually one of manoeuvring them out of the room they are situated in and out of the house. Moving these kinds of items is probably one of the most stressful elements of getting your belongings out of the house as you’ll often get puzzled thinking how on earth are we going to get this out. The important thing here is not to lose your cool. Remember, if it came into the house in one piece, it’s got to be able to come out the same way too. This is where furniture removal companies come into their own as they will soon see what the problem is and how to find a solution. You may, for example, need to remove some doors off their hinges and, maybe, you’ll have to resort to taking a piece of furniture out through a large window. The important thing is not to rush. Trying to force the arm of a sofa through an impossible gap next to a wall will probably just damage or scratch the piece of furniture. Obviously, whether the item will fit in to the new accommodation you’re moving to is another scenario entirely but you should check that out before moving and if it won’t, then the only options you have are either to sell the item, give it away, take it to the tip or put it into storage if you’re planning structural renovations in your new place which, when completed, will accommodate the item of furniture more easily. With all furniture, you should cover each item with a plastic sheet or sack-like material and if you’re moving things like two armchairs together, make sure they’re fully covered and secured tightly with rope or strong cord. You should refrain from cleaning any upholstery or furniture before you’ve relocated. It’s likely to get dusty during the move so leave the cleaning until you’ve settled in to your new place. You should, however, apply wax to any fine wood furnishings as this will help to prevent scratches. Wherever possible, make sure that the glass section from any piece of furniture is disassembled first and wrapped with thick layers of newspaper or some other kind of suitable packaging which provides a cushioning effect. This is not just a precaution against breakages but also to protect the glass from scratches and stains. Finally, make sure that any delicate items are labelled ‘fragile’, especially if you’re leaving them in the hands of the removal company. In fact, where costly items of furniture are concerned, it’s often a good idea to keep a watchful eye when these types of belongings are being moved as, although removal companies are experts at moving bulkier items, their income is often determined by how quickly they can complete a house removal and can move on to the next one, so they might not always place the same amount of value on an object as you would.